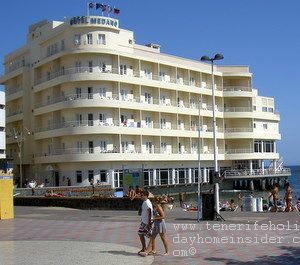 The Tenerife beach hotel Medano for relaxing or adventure holidays. This is all about a real Tenerife beach hotel, in the true sense of the word. Why? This holiday haven is built on stilts above the sea, as part of rare Spain architecture for Spanish hotels. This Canary Island hotel with its pillar structure gives good value for money to all who appreciate its fantastic location. It's also right by the pedestrian zone Paseo Picacho and by El Medano's main village square with all types of shops and good Spanish and International cuisine all around it. The Medano Tenerife beach hotel with its feet in the ocean and incredible kitesurfing nearby was build before the law started prohibiting building within 30 meters from the sea. In fact, it still comes up in the Media once in a while. Of course, it pleases Tenerife tourists, although it's the most elegant hotel around. Appreciate the stunning views of surf and Montaña Roja which almost frame Hotel Medano. Look out for the fish in the ocean in between its wooden veranda planks. They give the illusion of sitting on a boat with marine life below. With some luck, you know... Of course, a hotel price which starts below €30 couldn't give you designer food and all other features of a luxury resort. But who would miss it at this extraordinary place? Perhaps, it was really the hotel's architect who meant to portray it as a luxury, brilliant white cruise ship. But, who cares? Sit by a special look-out of this hotel with drywall stilts. Get comfortable on its timber terrace with an extra long drink. May the mellow, golden light of a sundown set you dreaming. It is almost bathing the blue ocean by the Red Mountain beyond. Don't worry about a lobby which almost looks like an over-sized hospital entrance and rooms with outdated decor, but enjoy their space, cleanliness and be happy with friendly staff. Also, you will be only 20 minutes from the Tenerife South airport. Occasional Live music may play at the Asian restaurant opposite this Tenerife hotel by the seashore, while an international festival with folk dance with international arts and crafts fair is also right by the hotels doorsteps at the end of August. by beach Playa la Chica and the TF1 up the road. Get carried away sitting by the ocean edge with this large tourist enclave as part of a captivating skyline by a large Atlantic bay. By the way, this hotel is not far from the airport of Tenerife south besides an alternative for reaching your flight even faster. It's the 3 star accommodation by el Medano of the true Southern airport hotel Monica Aeropuerto Sur which would translate into Hotel South airport. Encounter all kinds of airlines from this tourist haven after only 5 km. The following blog by Cho Vita in Spanish elespritudechovito with its entry of /2010/06/costas-y-el-hotel-medano is more than worth to be translated online. It doesn't only deal with what happened to the deplorable people of Cho Vita but, it also mentions the controversial Hotel El Medano, as it's more than close to the beach. All this trouble because of the Coastal law (ley de costas). Therefor, never buy a holiday home in Tenerife or any property in Spain which may fall under the coastal law. From Tenerife beach hotel back to hotels Tenerife .